The cyclone mooring pendant by New England Ropes offers tremendous strength and is designed to hold your boat in place in the most extreme conditions. The fiber from which 1/2" dyneema rope is woven gives you a breaking strength of at least 27,000 lbs. which is incredible. Realistically, the average strength for 1/2" dyneema rope is over 34,000 lbs., even more incredible. 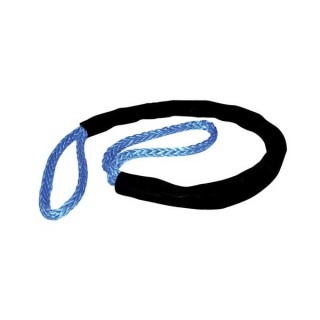 Since the dyneema rope is attached to at least one 3 strand nylon dock line or pendant, you have combined the strength of dyneema and the elasticity of nylon forming unique partners in safety for your boat. Dyneema does not absorb water and floats. Floating makes it easier to pick up your mooring when you return from your trip too. These pendants come with two professionally spliced ends and a generous professional chafe guard. Av. tensile strength 34,300 lbs. Min. tensile strength 55,200 lbs. Av. tensile strength 69,000 lbs. Min. tensile strength 27,440 lbs. Min. tensile strength 88,000 lbs. Av. tensile strength 97,500 lbs..
Min. tensile strength 46,400 lbs. Av. tensile strength 58,000 lbs.